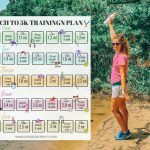 This post was sponsored by Angie’s BOOMCHICKAPOP, but ALL opinions are my own! 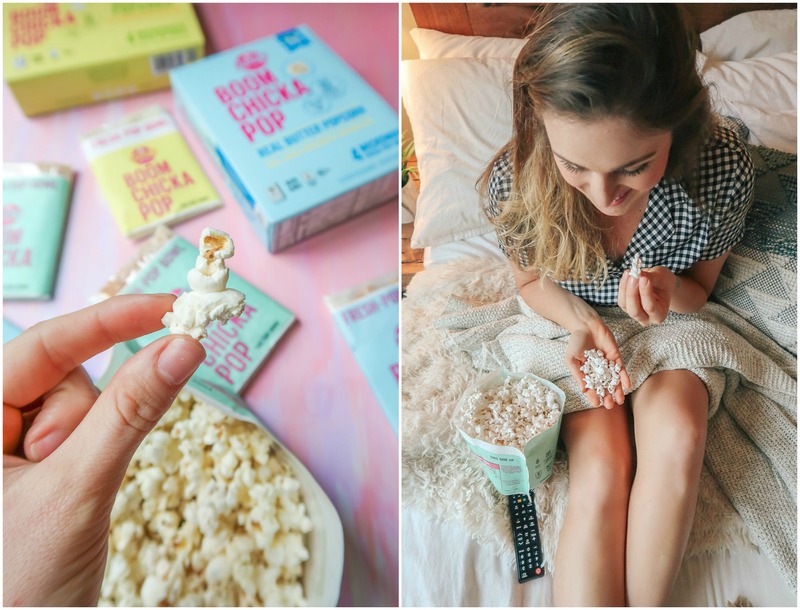 Today’s blog post is in sponsorship with Angie’s BOOMCHICKAPOP, one of my favorite snacks to wind down with at the end of the night! One thing I struggle with is just sitting still and being in the moment. My boyfriend calls me a “bopper” because I’m constantly bopping around doing something. After a while, it starts to catch up with me, and I get completely worn down. I try my hardest to dedicate one night a week to an evening self-care routine. Now that winter is coming and the nights are getting darker faster, I’ve noticed a significant change in my mood. It has me feeling so off, so these self-care routines are going to come in handy for getting me out of the funks as winter approaches. 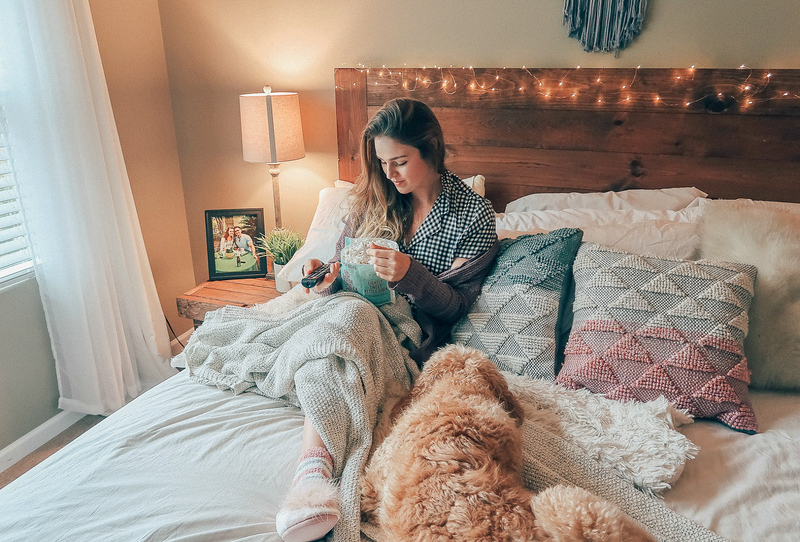 I love a simple routine that allows me to recoup, reflect, and relax while enjoying the small things. 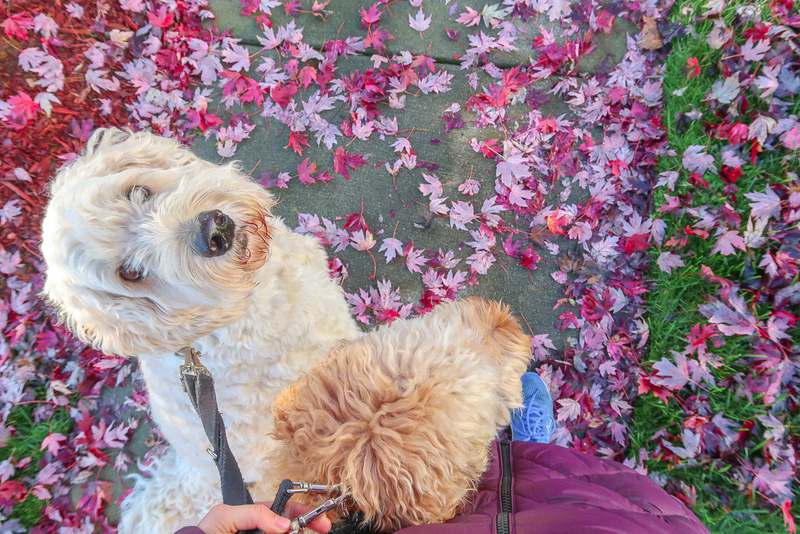 My dogs and I head out for our final mile walk around 7 pm after dinner. After this walk, they kind of know this is it, and it’s time to relax for the night. They also need and appreciate a routine. I love ending my self-care evenings with a walk because it’s the same time I shut down the computer and my phone. It’s how I leave it all behind and appreciate the moment. I take a lot of deep breaths on the walk to relax and release stress. By the time we get back to the house, I’m feeling all the endorphins start to kick in. I know watching the news can be informative and very important, but I’m watching it almost all day while working, so I love shutting it off and not letting it affect my mood. Instead, I pop popcorn and pick out a “feel good” movie to watch. 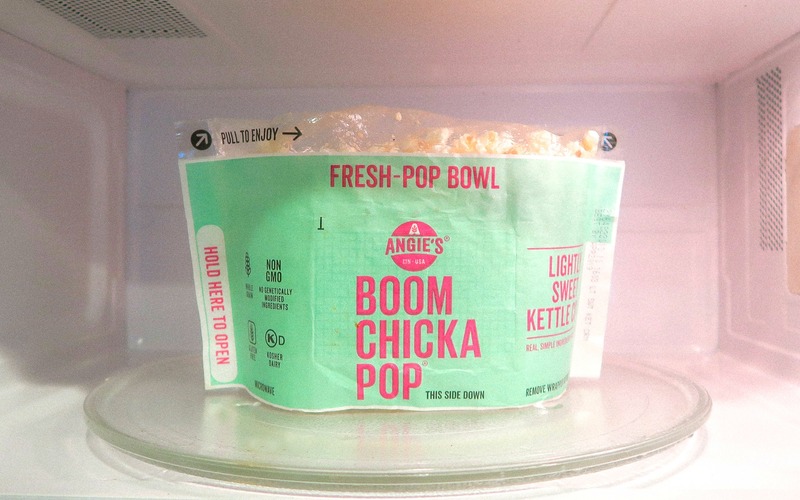 The “Fresh Pop Bowl” that Angie’s BOOMCHICKAPOP comes in makes it so much easier for popping and I love the no-mess concept. The bag is very thick; I didn’t have oil making its way through. The bowl also makes it convenient for popping and taking it straight upstairs! No one wants to do dishes on a self-care night. I like to pick out movies that make me feel good. Sometimes I’ll watch a chick flick that I’ve already seen a million times, or settle for a classic. I will never live by a “no popcorn in bed” rule. 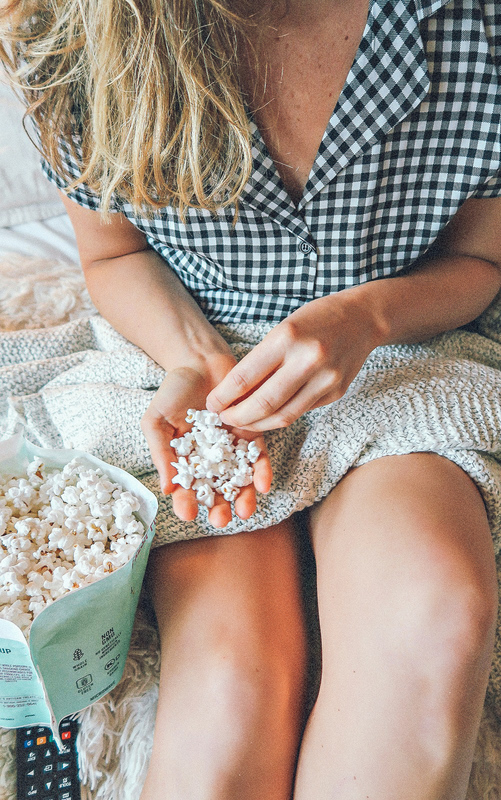 Popcorn and movies go hand in hand. 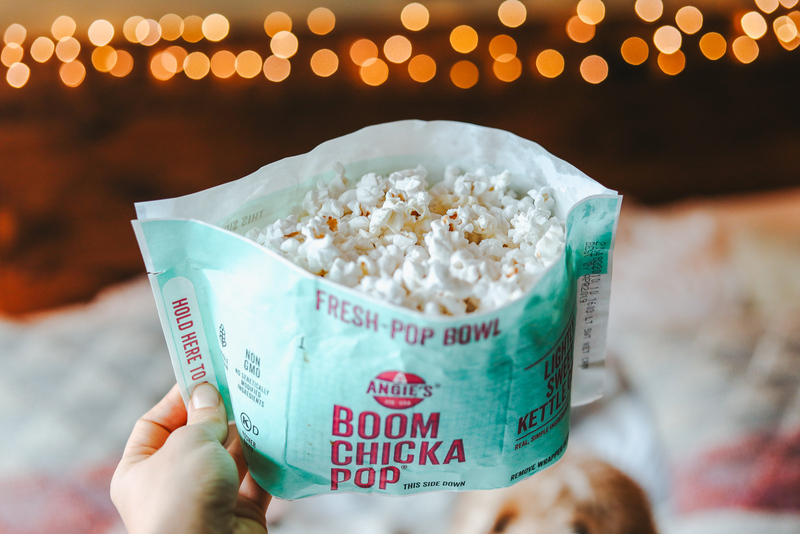 All of Angie’s BOOMCHICKAPOP flavors are made with whole grain popcorn, sustainably sourced palm oil and non-GMO ingredients. I also love that they are gluten-free and fit my lifestyle so perfectly. If you’re a popcorn champ like me, then you can probably eat the entire bag! Each cup of popped popcorn has 35 calories. Grab me a can of sparkling water to go with my popcorn, and I’ll be good to go for the whole movie! I don’t know about you, but self-care routines call for comfortable clothes! I put on my comfiest pajamas, slippers, and grab my favorite blanket to cozy up with. I’m so excited about these new microwavable varieties. This popcorn was SOOOOOOO good. Not going to lie, I snuck a bag into the movies on Friday night with Kyle. I couldn’t help myself (oh, don’t act like you don’t do that!) The lightly sweet kettle corn flavor really hit the spot! 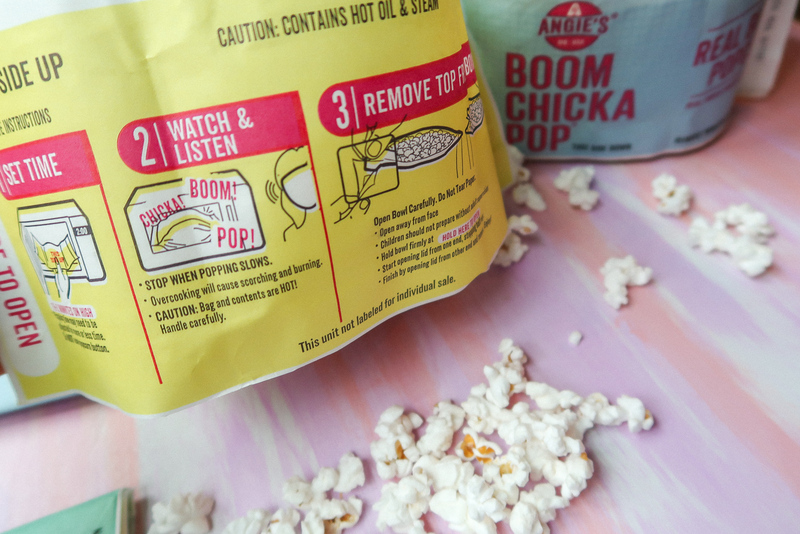 When I go on road trips or shopping for snacks, I usually buy Angie’s BOOMCHICKAPOP ready to eat products that come in the ready-to-eat bags. Those are the ones you guys are probably familiar with. They come in Sea Salt, Real Butter, White Cheddar, Cheddar Cheese, Sweet & Salty Kettle Corn, and Light Kettle Corn! And if I’m feeling festive, I’ll buy their seasonal flavors. After watching a good movie, I’ll make some hot cinnamon tea and put on several face masks! I do a couple to wash my make up off, some to exfoliate, and then a moisturizing mask to finish. 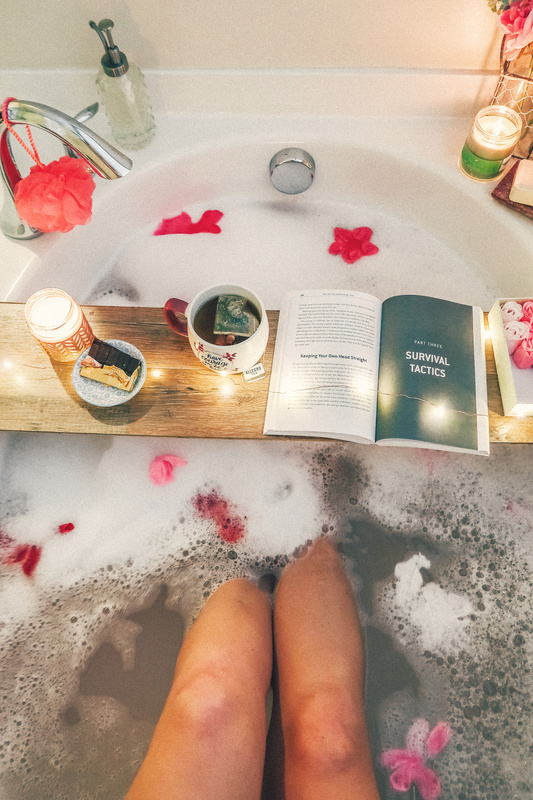 A warm rose water bubble bath with candles, hot tea, and a good book is the best way to end the night. Something about a hot bath when it’s cold outside relaxes me and makes me want to fall right asleep. Just by adding three or four simple things to your nightly routine can truly turn around your week. Self-care is crucial, so get to it. 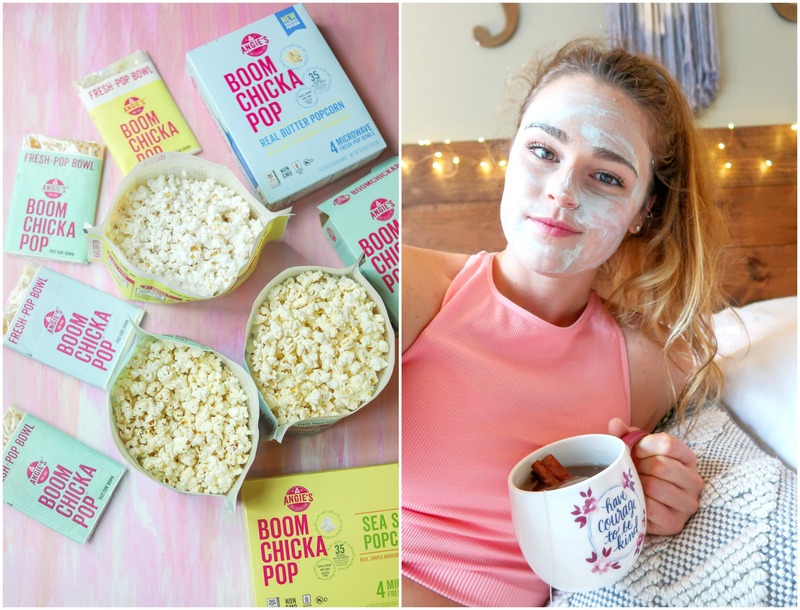 If you’re looking to have a self-care night soon, make sure to include Angie’s BOOMCHICKAPOP along with you! You can find the microwave popcorn at retailers nationwide and on online here! It’s only $3.99 a box which includes four delicious pop-up bowls! 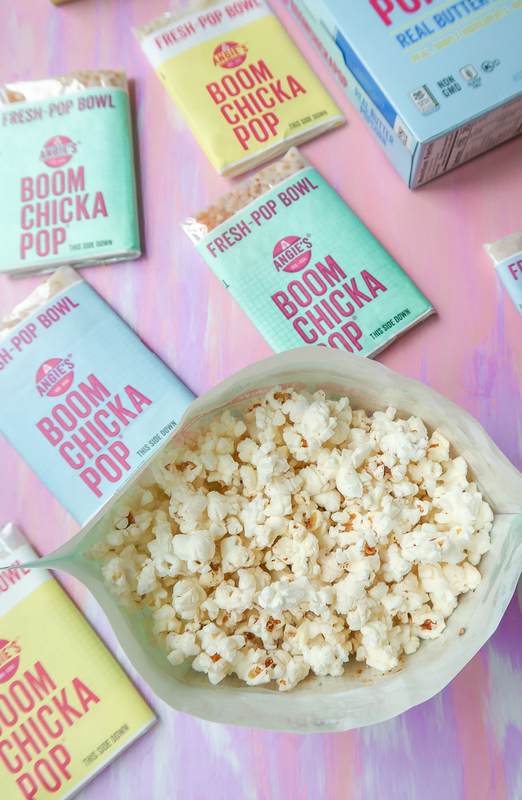 Which flavor of Angie’s BOOMCHICKAPOP do you want to try? What is your favorite way to eat popcorn? 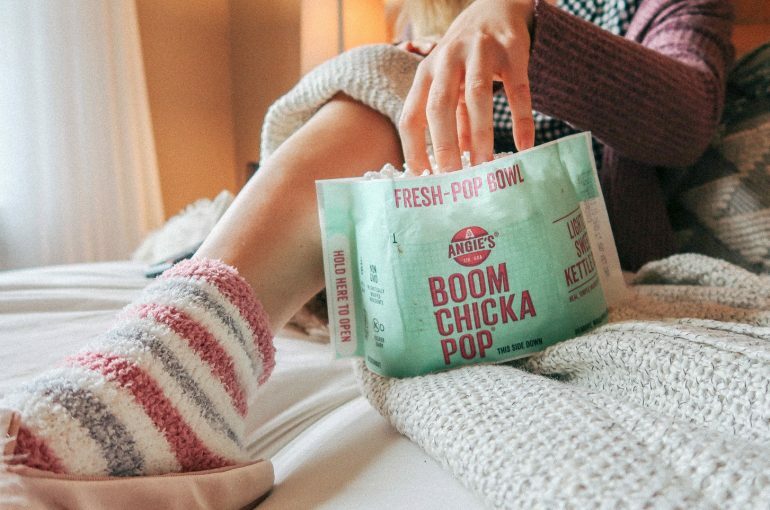 Sponsored by Angie’s BOOMCHICKAPOP, but ALL opinions are my own. This is exactly what I did last night after a rough day with my sick dog. From the bath, face mask, even right down to the light kettle corn but I had the pre bagged one I didn’t know they have microwavable now! Awesome! Hi, Amanda! That makes me so sad to hear. Nothing worse than a sick dog 😞 So glad you took some time to decompress and treat yourself. Love the post! Random question, but what is the name of the book in the bath pic??? Thanks! Called “all men are jerks” lol I had it as a bathroom decor a while back and then actually enjoyed it when I started reading it! My popcorn came in the mail today and we are obsessed! I love Boom Chicka Pop! Where are those socks from? I think Target or TJMaxx! Love a self-care day! I struggle with anxiety and am always looking for new ways to settle it, from books and relaxing days, to alternative medicine. Have you tried CBD oil for your anxiety? Crazy coincidence. I just bought CBD oil for my endometriosis this afternoon! I’ll let you know if it helps with my anxiety! I loved this post. I love boom chicka pop and over the moon that they have microwave popcorn bags now. Have you ever spent the entire day at a spa? You’ll love their new microwavable popcorn bags! Well my self care is very similar to yours, hot bath, tea, movies, face masks or perhaps whatever book I’m reading. I would love to try the Real Butter Angie’s popcorn. My fav way to eat popcorn is with brewer’s yeast sprinkled on it, so good! Ohh that sounds like a great night! I’ll have to try adding that to popcorn! I bet it makes it taste super cheezy! One thing I have started taking is from NOW True Calm it is all natural and it is to help with stress and anxiety. I take it at night along with essential oils and praying and devotions to help me relax. Im a constant Bopper too and have a hard time winding down! Having a self care night to myself is such a great idea. I also love popcorn so I cant wait to try Angies Boomchickapop! What a cute name for popcorn. I will probably try white chedder cheese first. My favorite form of self care right now is bubble baths and face masks but I definitely don’t it as much as I should.Adding a good chick flick in there is a perfect way to end the night. ALWAYS Boppin too! I hope you enjoy the popcorn! It’s so great and a good way to wind down. I have never see the Boom Chicka Pop microwaveable bags. I only thought they made ready-made popcorn! I completely understand about being a bopper. I love that Kyle calls you that. My job makes me be a bopper. I have to be super efficient so if I am not doing something I always have all of the nervous energy. 1. My friend makes bath bombs so I have recently started taking baths for self-care. I also love face masks. I never liked baths until recently! Your pups are too cute! I love to go to hot yoga on winter nights after work to help with the time change! I cannot wait to try out this popcorn. Thank you! Hot ya sounds great this time of year!! Long time reader, first time posting! You’ve been such an inspiration over the years and a breath of fresh air! 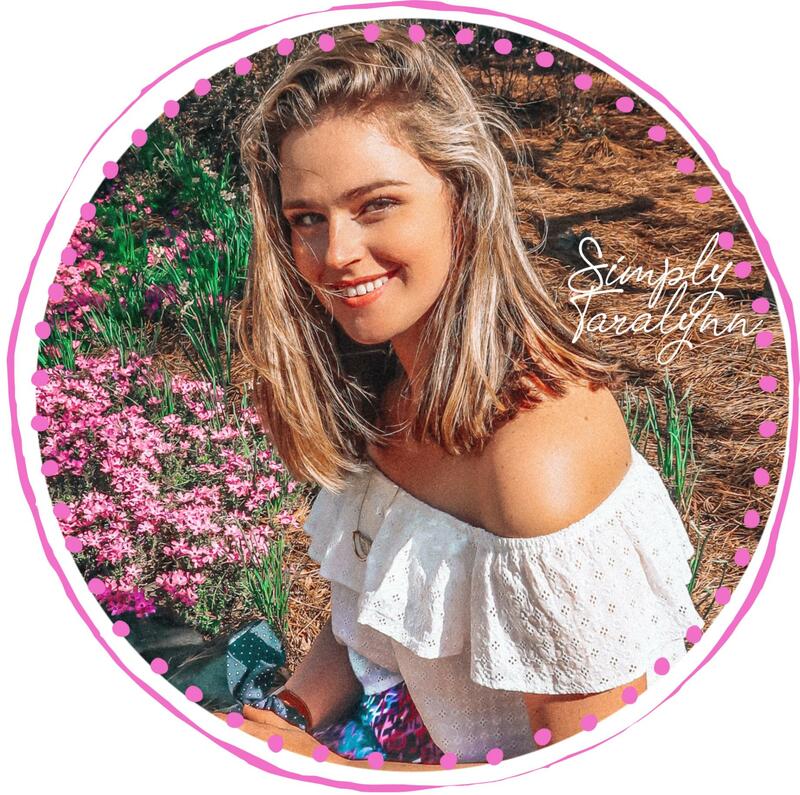 I love how authentic, genuine and positive you are in your posts. Especially being grateful in the simple things in life. I’m glad there are people like you for younger girls to look up to, and even myself, who is a few years older than you! I really hope you know that there are lots of people like myself that may never comment but are always rooting for you! 🙂 You’re one of the few bloggers I actually follow for the last several years! I feel like you’re a long-time friend! So it makes me happy and excited to actually write/comment to you now. Hahahah… Okay, well, I think this might be a little long so please bear with me! So sorry in advance!! -.-”” LOL. LOVE the entirety of this post – from the idea to the products. 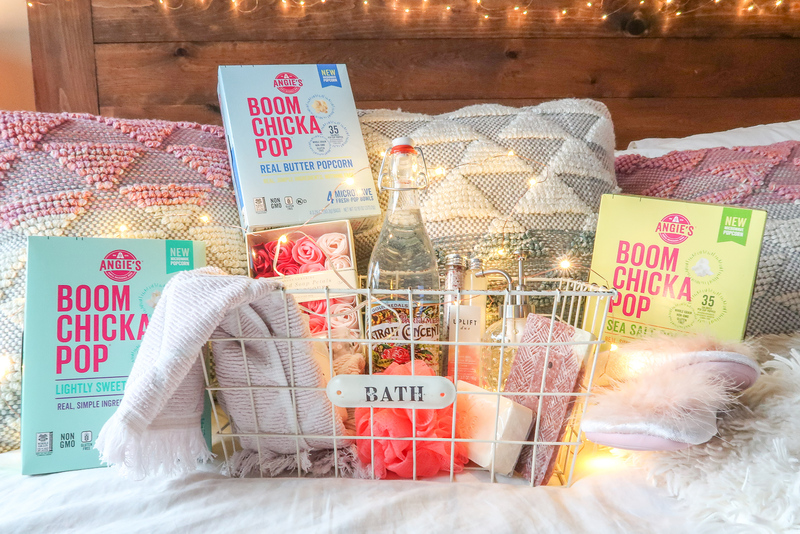 I’ve never tried BOOMCHICKAPOP, but I’ve always wanted to and you’ve now convinced me, for sure! I need to initiate more self-care things into my own day and I think this was the push of motivation I was longing for. I cannot believe you haven’t tried Angie’s BOOMCHICKAPOP! 😳 You’re in for a real treat. You’ll have to let me know what you think! 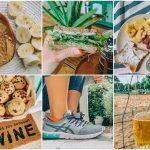 I didn’t start doing self-care days until my late twenties, but now they are much-needed! Are these dairy free/vegan? 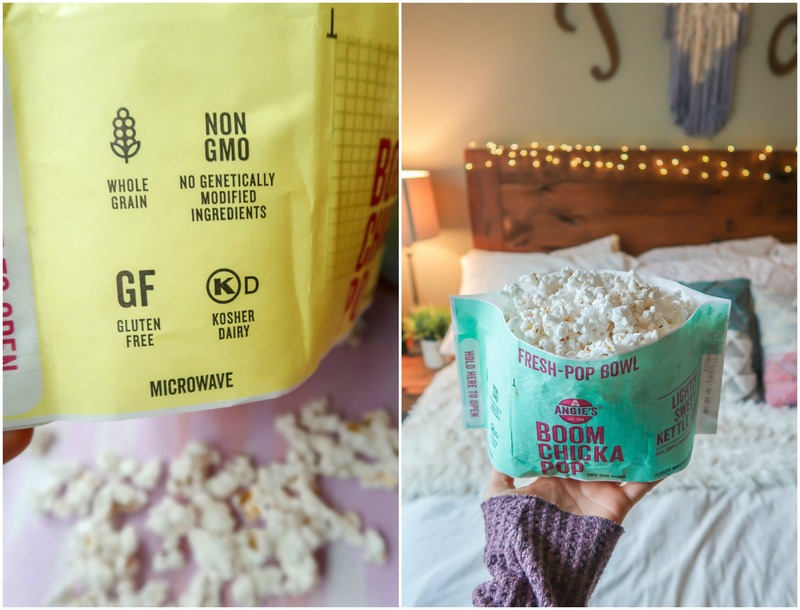 I’ve been looking for a butter free microwaveable popcorn variety! ugh, I seriously hate to be this person, but… Please be careful about eating/using products containing Palm Oil. I know it’s in practically everything, but palm oil is causing deforestation, thus leading to be a culprit in animal cruelty ( which I know is important to you) as well as climate change. I’m honestly not trying to be preachy. I think it’s just something that people are not super familiar with, and it’s truly something that is causing a major impact in our lives right now. You have such a great platform with your blog to make your readers aware! Awhhhh I need to try this!!! 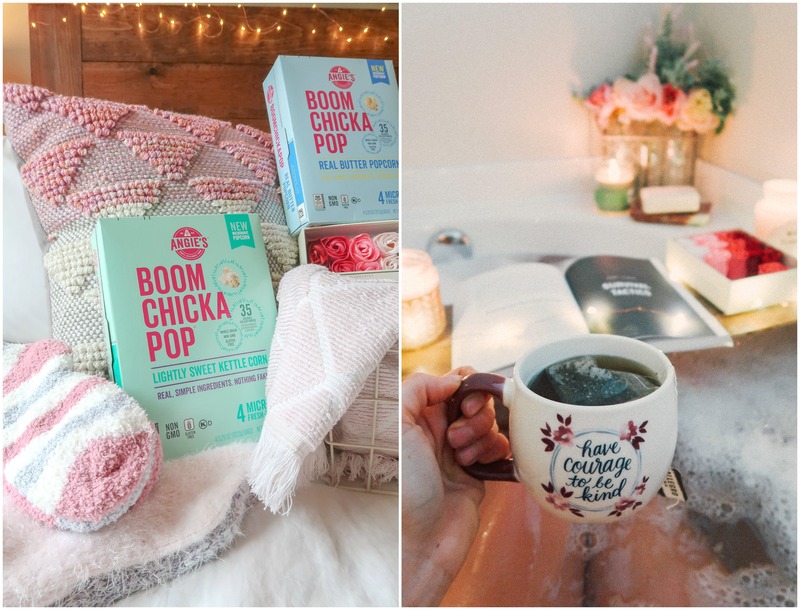 Love this post <3 Looks like the perfect way to unwind!!!! I try to do mask mondays but they haven’t been happening lately. I’ve been under so much stress. Actually yesterday I took the day off for a mental health day and spent it with a girlfriend. Kettle corn for sure! I’ve tried some before but I can’t remember if it was the kettle corn or not…. I like popcorn with garlic salt fresh out of the microwave! I’m really glad you addressed the way you were feeling and took the day to recoup and de-stress. I hope you have more of those days! The kettle is my fave, too!! That is the best popcorn ever!!!!! I did not know they sold microwavable popcorn! You don’t understand how happy this makes me. I love your bathroom set up.